Click on any of the TEAL links to travel around our site. 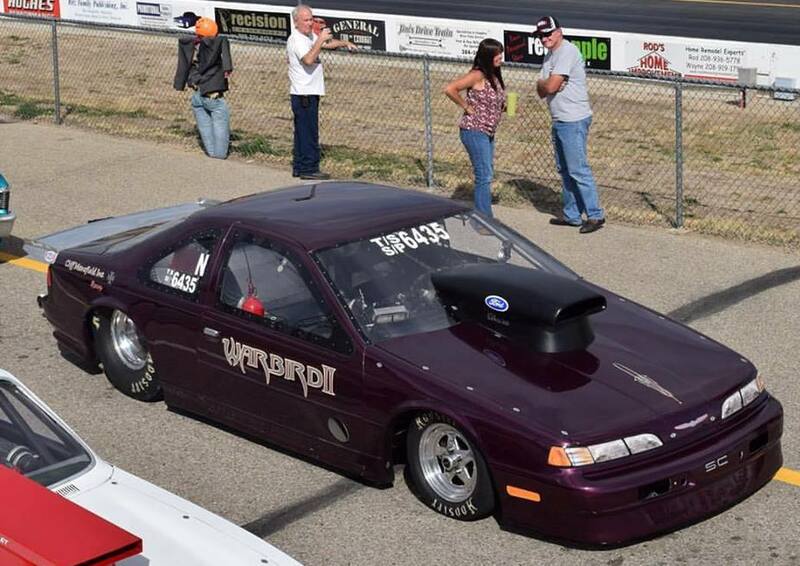 This is my 1991 Ford Thunderbird tube chassis race car. This 2,780 pound rocket ship now has a 624" big block Ford with over 1200 horsepower, a Hughes Turbo-400 (was a Power-Glide), a Ford 9" with 4:11s and a spool. The car is called "War Bird II". It's built for the Top Sportsman & Super Pro Class. In early 2014 we ran 7.88, around 172 mph. As the year progressed we got down to 7.70 @ 178.60 mph with a 1.09 second 60 foot time. It was 84� and the effective altitude was 2,650 feet. 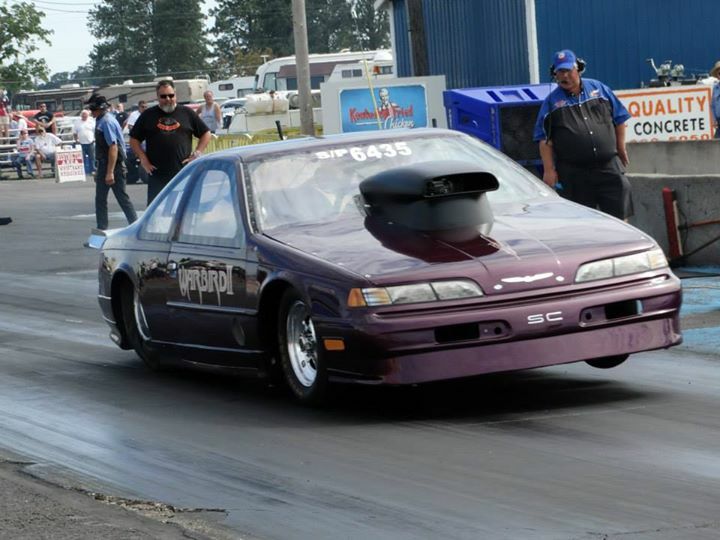 Our home track Woodburn Dragstrip near Woodburn, Oregon and the altitude is 200 feet above sea level. This 624" big block Ford makes over 1200 horsepower on motor. We used a Tunnel Ram with two Quick Fuel 1150 cfm Dominators. It feeds the power through a Hughes "Extreme" TH-400 to 3.89 rear gears. Racing in the Halloween Classic, Boise Idaho. One of our favorite venues. We got to the Semi-Finals in this race in the Super/Pro class. Spiderman did the custom graphics and original artwork on the "Iron Gladiator". He did a fine job, I highly recommend him. Give him a call at 503-956-2013. 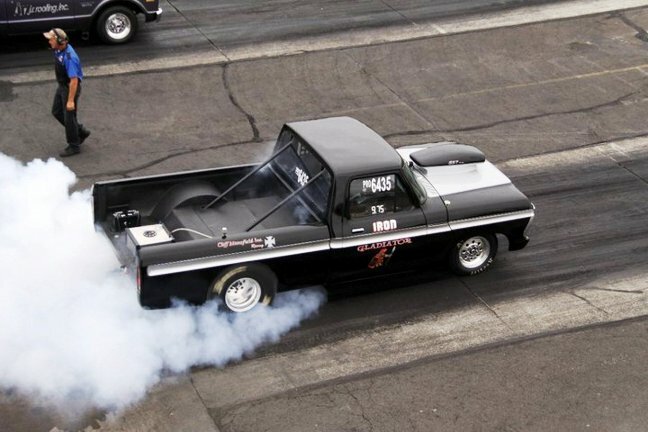 The 1050 horsepower 606" cubic inch Ford pushed the 1973 Ford F-100 to a best of 9.21 @ 148.5 mph. This pickup is NASTY!!! Smokin' up the Hoosier 32 x 13.5 drag slicks. Long, smoke filled burn-outs were our trademark for the day. The truck launches straight, wheels in the air. 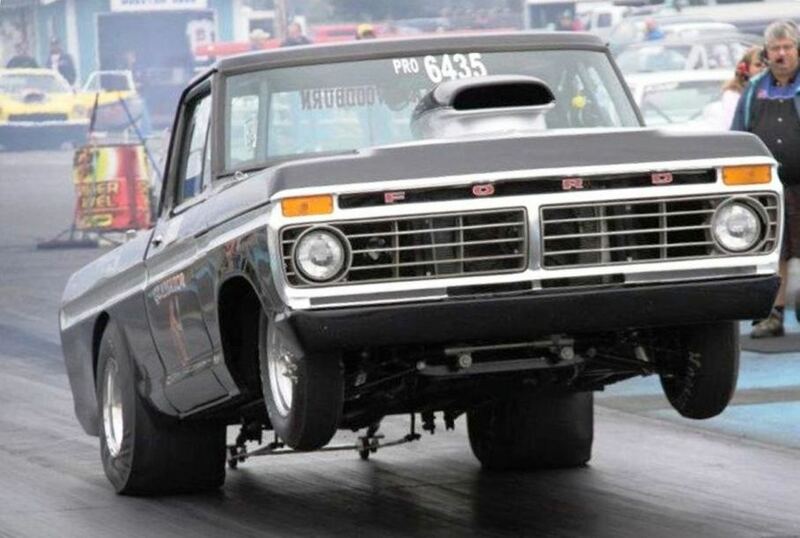 We switched to Goodyear, D-5 33 x 16 x 15 slicks and our 60 foot times, dropped to 1.28 and we were doing 100' wheel stands. Early in 2013 went to a 4.30 gear. The Turbo 400 with a 2.75 first gear was built by the fine guys at Hughes Performance in Phoenix Arizona. On our first pass a driveline failure (who knew about HARMONICS?) destroyed the transmission. Pete Nichols at Hughes Performance had the transmission picked up from our shops and they repaired it for no charge. I had it back in a week. In my opinion you simply could not find a better group of guys than Hughes Performance! Nice overhead shot by Mr. George Adams. We Proudly Support Our Troops in Iraq and Everywhere Else! If you can't get behind our troops, please get in front of them. Copyright � 2018 C. M. Classics. All Rights Reserved.